Bastrop County is located only 30 miles from Austin. What a perfect location to find a cabin in the piney woods for sale or farm or ranch for sale in Smithville. If you prefer a small town with all of the amenities then you might want to stay close to the town of Bastrop with its charming downtown filled with shops and restaurants. If you want the country life, then a farm for sale in Paige or a ranch for sale in Rosanky might be better suited. The Bastrop County Courthouse in Bastrop is designed in classical revival style. Built in 1883, the Courthouse and Jail Complex were listed in the National Register of Historic Places on November 20, 1975. Bastrop County is located approximately 30 miles southeast of Austin and is a part of the Austin-San Marcos Metropolitan Area. The area was settled in 1829. 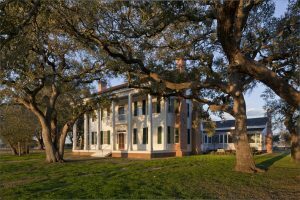 The county was created in 1836 and named for Baron de Bastrop, who aided Moses Austin and the Anglo colonists in the settlement of Texas. Bastrop County was among the original ten counties established by the Republic of Texas in 1836. The population of Bastrop County in 2000 was 52,561. There are two parks in Bastrop County that are lush with Pine trees and hiking trails. Bastrop is about community, whether it is in facing the largest wildfire in Texas history, in preserving and enjoying our natural resources, or in sponsoring the Fourth of July Weekend Patriotic Festival and fireworks on the Colorado River. The Bastrop Chamber of Commerce is an integral part of the fabric of that community. Members build their businesses while helping to build a solid community we are all proud to call home. The city is steeped in history and is ready for the future. Located 40 minutes from Austin; two hours from Houston; and 45 minutes from San Antonio, in Bastrop they have easy access to everything a big city offers – without the big city headaches. ?VIEW HOMES FOR SALE IN BASTROP COUNTY BELOW? Smithville is really starting to thrive and it has some fantastic new places to eat, shop and hear live music. The land is lush because of the proximity to the Colorado River and it offers beauty and recreation, a centralized location that’s perfect for the commerce of all types and a community atmosphere that invites you to visit for awhile. From easy access to the Colorado River to rich railroad history, eclectic, charming Main Street to modern conveniences and lovely B& B’s, Smithville invites visitors to come and relax. The central location, between Austin, San Antonio, and Houston, makes doing business in Smithville a great alternative for your business. There are a few other small towns like Paige and Elgin and McDade with nice land that is very well priced. The proximity to Giddings, Austin, and Bastrop in some of the smaller towns can offer you privacy and seclusion if that is what you are looking for in a country property for sale in Bastrop County.